It's that magical time of year again and we have rounded up 20 inexpensive Christmas gifts for her under $20. Although I have selected inexpensive items to fit into most peoples budget, they are anything but cheap. So this Christmas, give her a gift she will really enjoy! What makes this selection different is most of them have been chosen from art & craft fairs in the Boston and Cape Cod area put on by Castleberry Fairs, one of the premier art & craft promoters in the country. These are fairs I have participated in as a vendor and know the crafters and the quality of their items. And you won't find ideas like this in any box store. They are unique and hand-made. Wine slushies are all the rage and women go ga-ga over them! The perfect stocking stuffer for all your wine loving friends. The dry mix package from The Wine Slushie Guy is added with a dry white or dry red wine and ice in a blender to create a frozen treat in 30 seconds that is a slice of heaven. And when your friends go to make this, who are they gonna call? That's right...you. This is a gift that gives back to you. You're welcome! Brighten her holiday decor with this gorgeous Christmas wine bottle light, hand painted with deer walking through a snowy forest. The word "joy" is written in the snow, but it can be customized with any word or phrase you would like. Painted with enamel paint and oven cured for durability, this bottle light is illuminated using battery powered cork lights. I see similar items at fairs all the time and I will say, for all the hand painted detail work Bring the Joy Creations put on these, this is a bargain. I love you to the moon and back. Well said. Put this under the tree and she will love you to the moon and back as well. 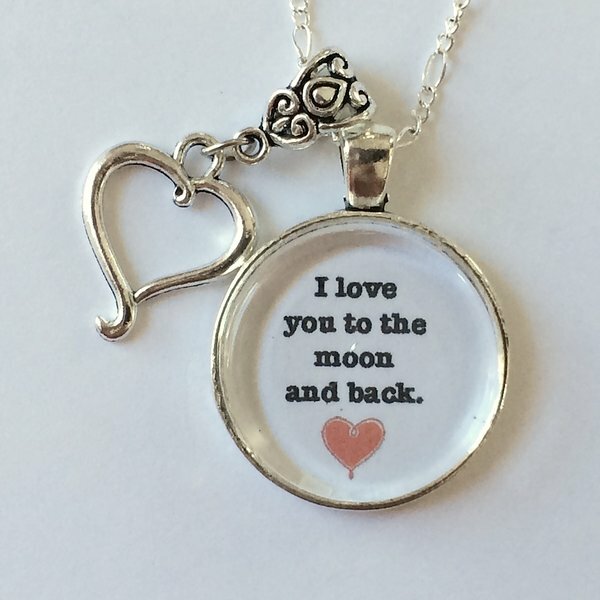 This beautiful piece includes the accent charm (heart or moon) and a silver-plated chain. Amy, the artist at Mainely Local, also has a wide variety of map pendants from the USA and all over the world that are one-of-a-kind. Pamper her! ...this rich, yet sweet floral scented soap will have her wishing for spring all year round! Dried blueberry seeds are the unique exfoliate added to this soap. Ooh la la, is it any wonder this soap is rising to the top of Rocky Corner Soapworks's best seller list! A gift that will make her feel luxurious. For the green thumb...or maybe not so green thumb. 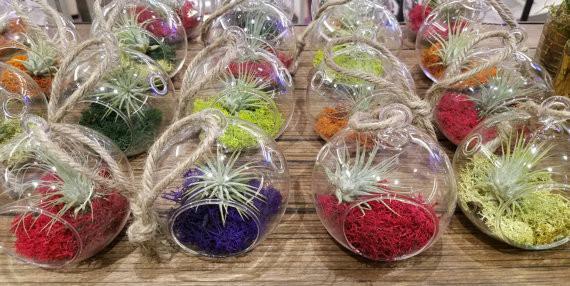 Jordan's Jungle offers you low maintenance, easy to care for Air Plants add life to just about anywhere, with minimal care or effort on your end. I have one, and will tell you it's still alive after 2 years and I'm no green thumb. Hand blown glass and finished with rope for hanging. They are flat on the bottom too, so they can sit upright if you don't want to hang them. This beautifully made, hand-crafted mug from TB Pots Stoneware Pottery is a great gift for anyone who likes a good cup of Joe...and that's most people right? Lead free, dishwasher, microwave, and oven safe, this coffee mug will be the one to reach for. Candles are always a go to gift women love, right? With this 12 oz soy candle from George at Harbor Candle Company, you not only get a delightful candle, but one that burns long and clean too. Be Captain Romantic this year and give the woman in your life a little bauble. Exquisite peal and gold earring says luxury. And these inexpensive earrings from D&D Beadworks will make her feel like a million. For the woman who likes to cook. Easy to use and impossible to cut your fingers on, Kathleen, the Grater Girl delivers. Not only can you grate garlic, but can be used for cheese, chocolate and more. The grater kit is a gift you may want to give yourself and it is not one that will sit under the cupboard unused...you know what I mean. So true, so true. This is for the friend in your life who's friendship you value and treasure. Created by Dorothy Spring Home Decor. For the woman who wants to keep her hair out of her face and look fashionable too, these hair buns will keep her in style. Easy to use, these buns from L A Parker Designs will be her go-to accessory. I see these bags with the anchor on them from bLife by Sonya everywhere. Durable, functional, and stylish. A great value. Another item that seems to be all the rage at art & craft fairs is the melted wine bottle cheese tray. I've seen them priced twice as much. At under $20, this is a bargain. Order yours from RayMels by Dec 15th to be delivered by Christmas. These magnetic bracelets are not only a beautiful piece of jewelry, but may also relieve pain...a two-for-one. With the relatives coming over, this will be just-in-time pain relief. Ok, that's a different kind of pain. Did I just say that? Love is in the air...and now could be on someones wall reminding her of you. From your heart to theirs this Christmas. Fashionistas look out! This goes on like a scarf, but wears like a necklace. 700 beads put on by hand. Now that's love and a bargain at any price. Calgon move over. With these all natural exfoliating sugar scrubs from The Primitive Keeper, you will feel like you are wearing silk gloves after you “Wash Away the Day”...and she will thank you. A gifts for lovers! Many of these have traveled down the aisle with ring bearers while others remain in two parts with separated lovers until they are rejoined from their distant travels. These are hand made in Costa Rica and I was next to this vendor at a seafood festival in Hampton Beach, NH and can tell you all of their wooden pieces were flying off the shelves. Chocolate lovers will rejoice. I can personally attest to how good these chocolates are after trying them...several times. Using her grandfather's recipe from the old country, Kirstyn from Seacoast Sweets shares this goodness. Classy, elegant, and downright delicious, you can give this not only to women, but to anybody and everybody. Warning: You may be tempted to eat this yourself before it makes it under someone else's Christmas tree. Order by Dec 15th to be delivered to said tree. Don't forget Grandma! (Grandpa too will actually like this one). What grandparent doesn't love their grandkids? Give them a gift that will melt their hearts all year round. These grandchildren signs from Family Signs are custom made with each grandchild's name and the signs can go from one to thirteen grandchildren. Order by Dec 15th to be delivered by Christmas. Have any other suggestions for inexpensive Christmas gifts for her under $20? Let us know in the comments! » Do You Make These Mistakes Making Wine Slushies?